When I get really busy during the week, I have to have something that is quick and easy to make. And though a big pot of chilli or a casserole can make a fast dinner or a lunch to go, I found I got tired of it after a few days and would rather buy something on the way home than have the same thing for dinner. So I came up with this mix. 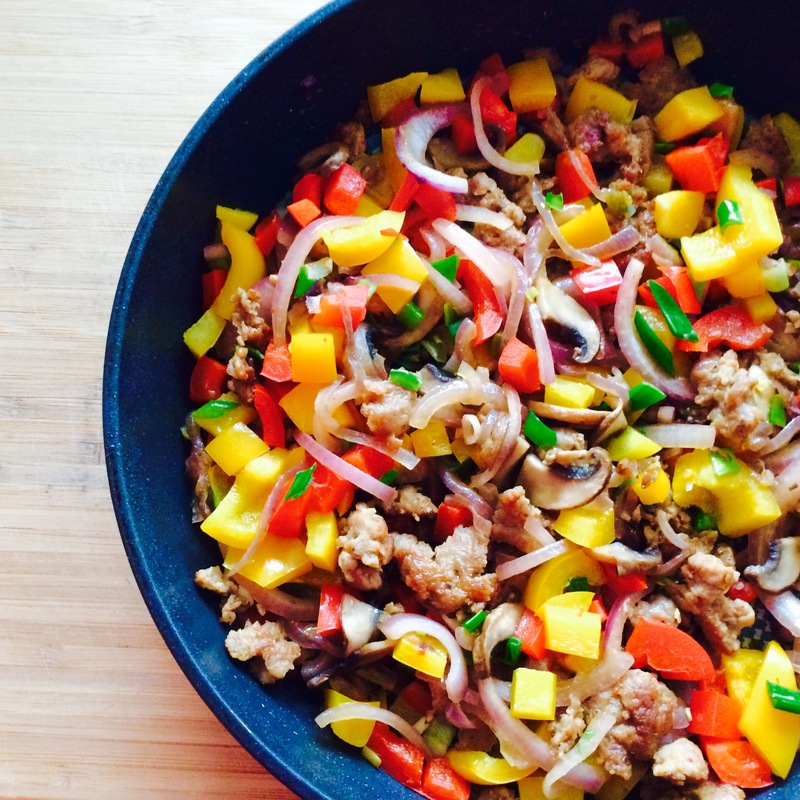 One big pan full of sausage, veggies and flavor! This is now my weekly staple. Every Sunday I make this and use it throughout the week. I make omelettes, pizzas, flat breads, wraps, frittatas, and pastas. Having this is the fridge means I can always make something yummy in no time. Remove casing from sausage and add to a frying pan on medium heat-high heat. Break up sausage and let fat melt. Add red onions, let soften slightly. Add mushrooms. Once mushrooms are cooked add the red and yellow peppers. Fry for 5 minutes. Turn off heat and add the green onions. Let cool completely and keep in a plastic container in the fridge for up to a week. You may have noticed that I didn’t add any seasoning to this dish. That is because the sausage I used is full of flavour and lightly seasons this dish for me. I buy my sausages from Bespoke Butchers. It is by far the best italian sausage I have ever had. It has so much flavour from the herbs, heat from the spices, and the salt is just enough to season the veggies. The meat is also good quality and comes from local farms with ethically raised animals. That is something that is important to me and I find this care and quality shines through in their products.